As YouTube and Twitter have become essential marketing tools for brands and companies, there has been an emergence of startups that help marketers track the buzz around a certain individual or brand. Radian6, Visible Measures, Omgili, Omniture and a plethora of others offer tools to monitor blogs, Twitter, YouTube, Facebook and other social media sites for mentions of a company or individual’s name. Startup Viralheat is entering this space with the private beta launch of its affordable social media measurement product that scours social video sites including YouTube, Hulu and Vimeo, and Twitter to deliver real-time results of consumer generated content on these sites. Viralheat allows you to create profiles to track an individual’s name or a company’s name across nearly 30 video sites and Twitter. The platform’s Twitter tool provides data on how many total mentions an item had on Twitter for the week and for the given day, the most active Twitter user who has Tweet about a brand, the most common language of Tweets, percentage of Tweets about a brand that are Retweets, the most active day of the week for mention of a brand and a sentiment breakdown of Tweets. For example, a profile created for “Obama” shows there were just over 7,000 tweets today including the name “Obama,” and over 32,000 total Tweets this week. The service also provides a graph of the number of Tweets over the past week and shows the most recent Tweets about the item updated in real-time, which you can Tweet out directly from Viralheat’s platform or email to others. The video tool will filter the breakdown of a brand or individual over video sites, letting you know how many mentions were made over each video platform. The video dashboard will let you know what the most popular video was, how many videos were found with a certain brand or name in a given week, the average number of video downloads per day and how many total views the videos received in a week. Similar to the Viralheat’s twitter feed, the site pulls in a real-time feed of the videos and allows you to email or tweet links to the videos directly from the platform. Any data from the Twitter and video dashboards can be exported directly into PDF files or Excel spreadsheets, making it easy for marketers to share this data with others. 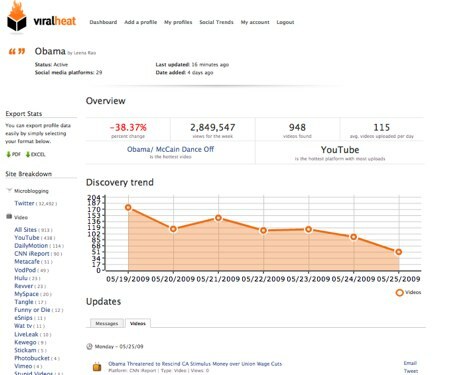 Viralheat also lets users share a snapshot their profiles of brands, trends, individuals, etc. with the public. 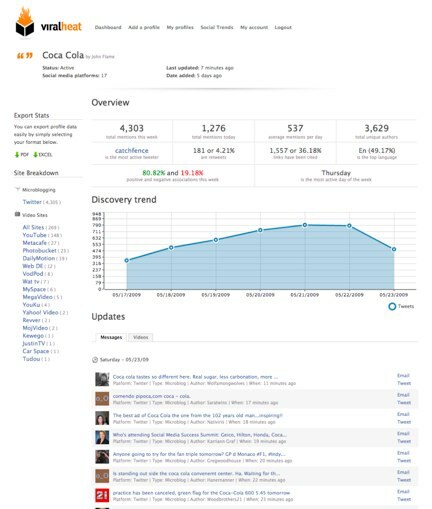 Under a trends page, anyone can see the performance of profiles of brands or individuals broken down by subject (politics, sports, movies, television). Viralheat’s service could be a cost-effective and user-friendly way to view social metrics data from Twitter and video sites. And the price for the tool is easy on the wallet—for $10 per month, you can track 10 profiles on the site. For $40 per month, you can track 50 profiles. There’s no doubt that tracking Twitter is useful to companies and brands, but Viralheat’s reach is currently limited. One major drawback is that the site doesn’t allow you to track other social networks where brands are commonly mentioned, such as blogs, Facebook, MySpace, LinkedIn and Flickr. The startup says that it has plans to incorporate blogs, sites and social networks into its dashboard over the next few months and will not be planning to change its pricing structure when these services are added. Viralheat also plans to add an app store-like marketplace where users can add extra tracking items, such has the ability to track top keyword searches and tags for a profile.